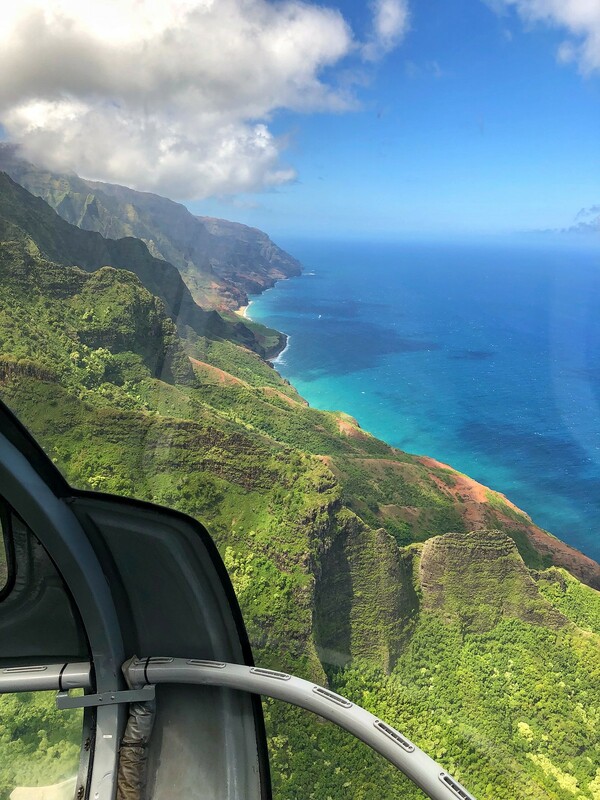 If you’re not a regular reader of mine, then I’m sure the reason why you stumbled on this particular blog post is because you’re planning a trip to Kauai right now. 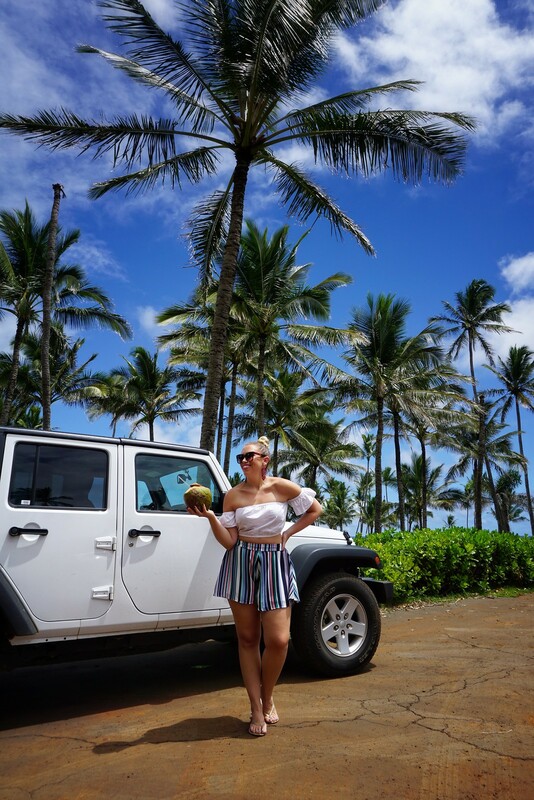 And if you are then I’m absolutely sure that you’ve done TONS and TONS of research and have already read a million blog posts and articles that have told you to visit Queen’s Bath, eat shaved iced and check out Wailua Falls….but this post isn’t about necessarily about that. 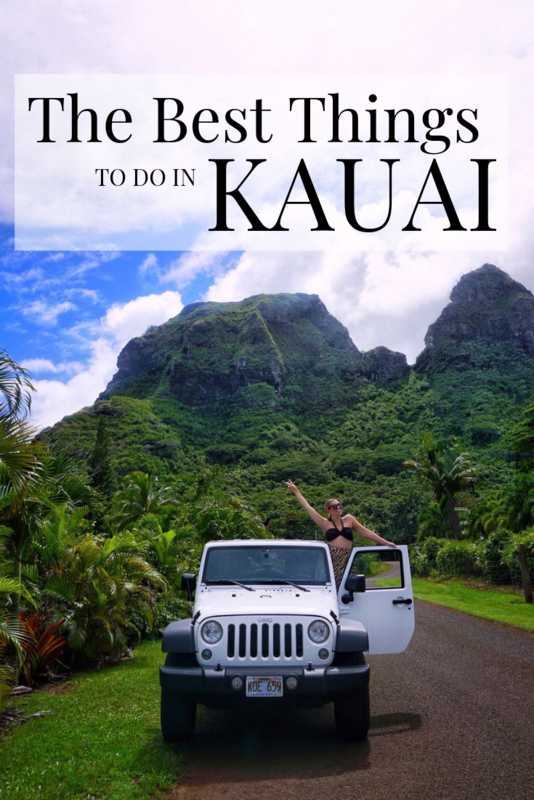 While all those things are great and should absolutely be on your Kauai list, these are the ten best things to do in Kauai that you might not heard of yet! 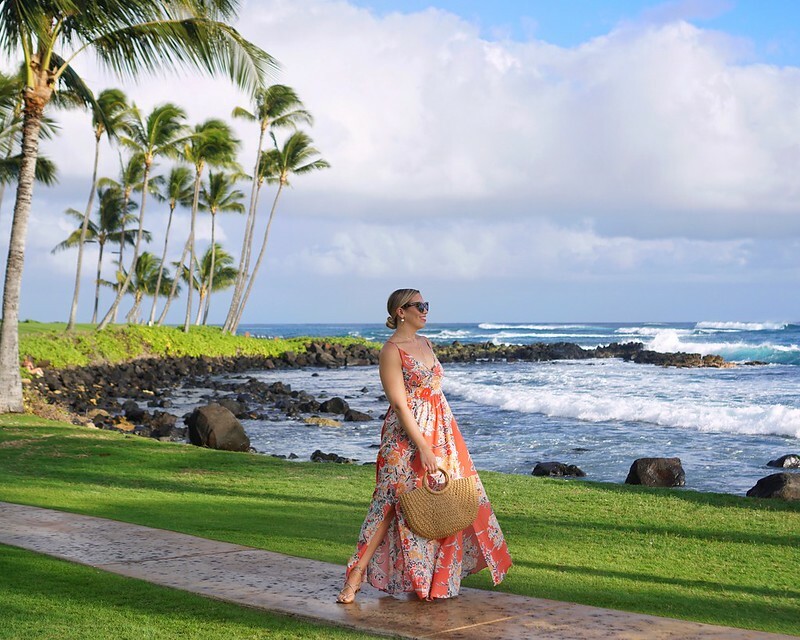 And if you’re headed to Maui on your trip too check out my Best Hotel in Maui post & my Five Reasons to Visit Maui post! 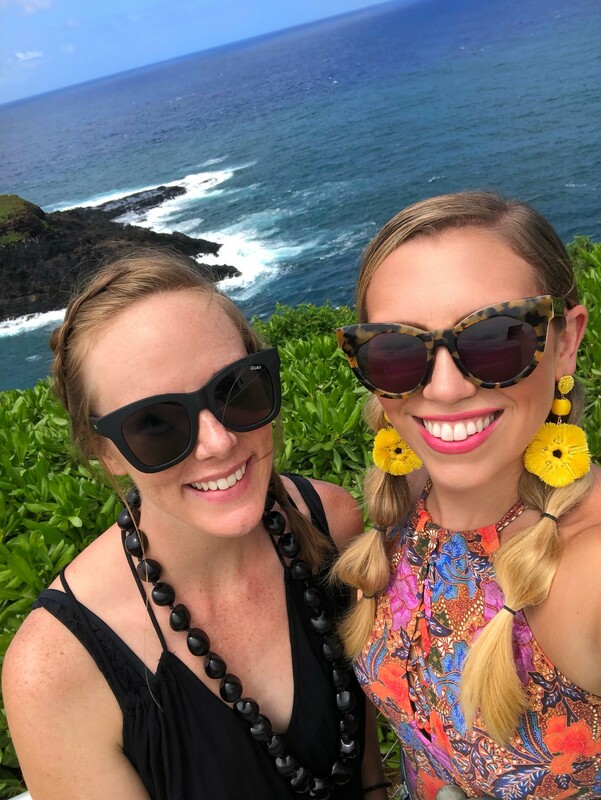 If you read my Maui post then you know that we downloaded the GyPSy Guide app when we did the Road to Hana, but when we did that we discovered that there are GyPSy Guides for each of the Hawaii Islands (along with other places in the US and Canada). 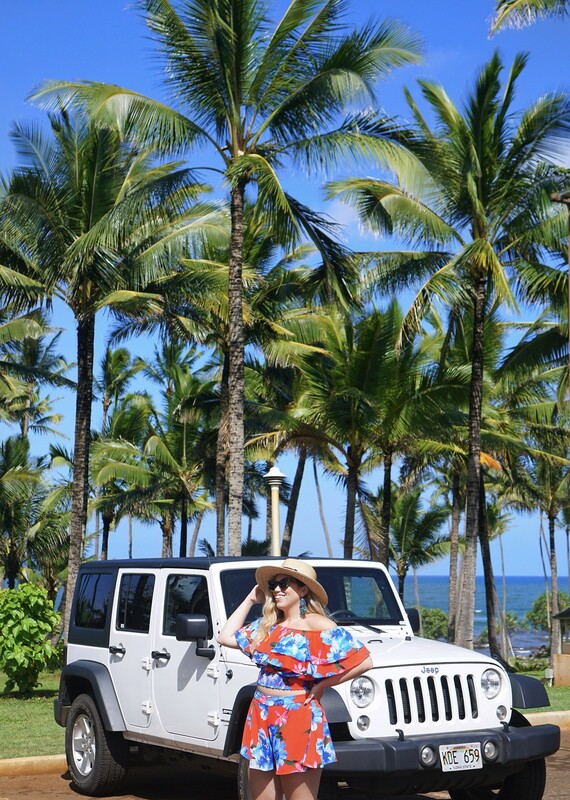 We found SO many amazing places in Kauai because we just turned on the app and drove. 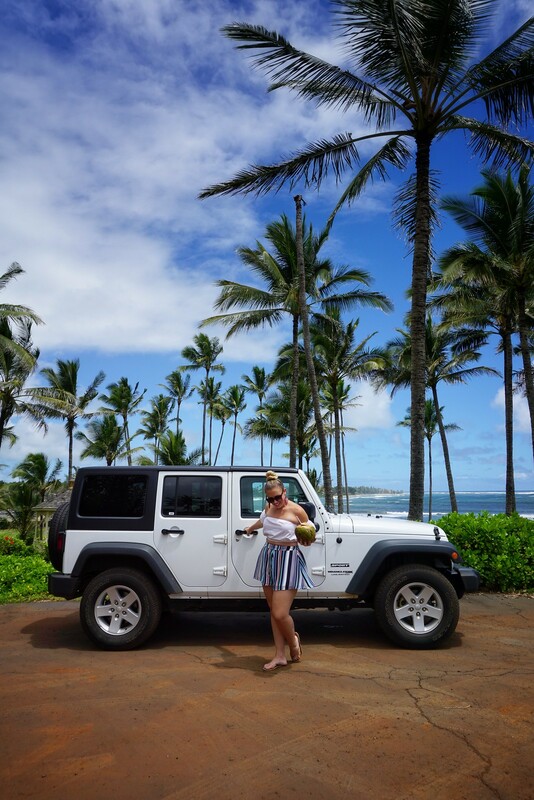 While we’re on the topic of driving around Kauai I thought I would include what car you should rent! 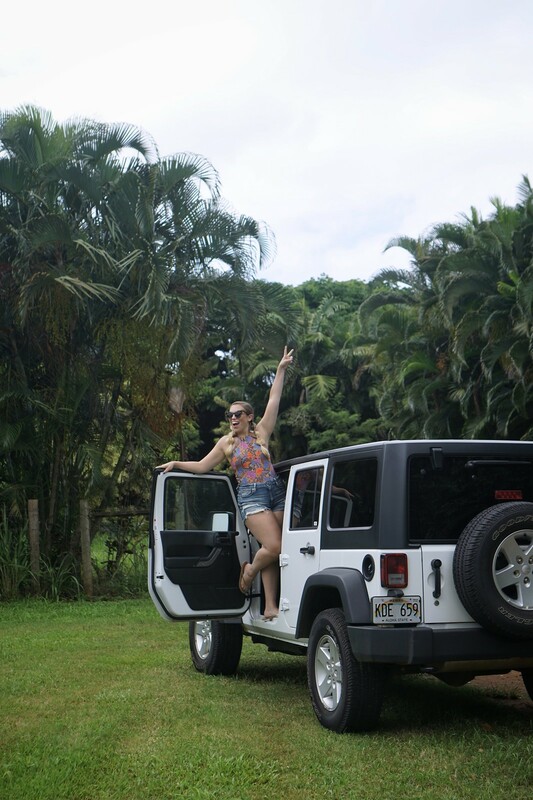 Obviously it should be a Jeep! 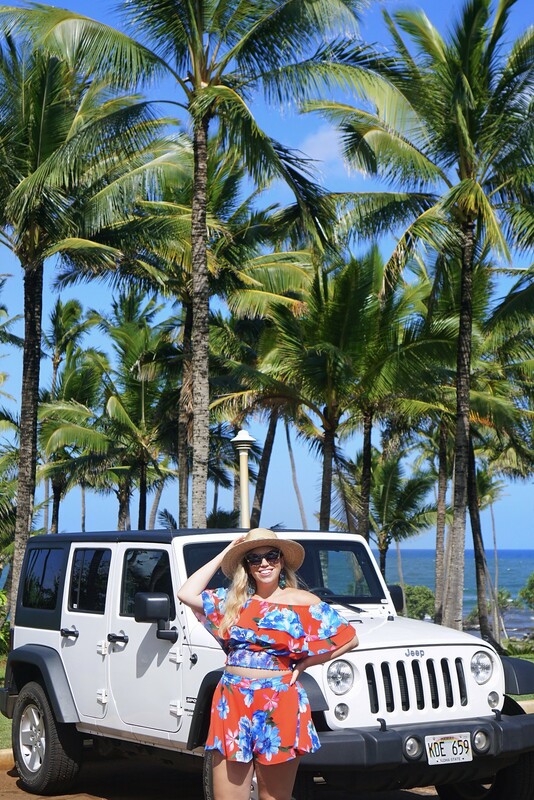 Considering Kauai is the Garden Isle there’s beautiful scenery at every turn and I guarantee you’ll be spending a lot of time in the car so might as well make it roomy…with a detachable roof! 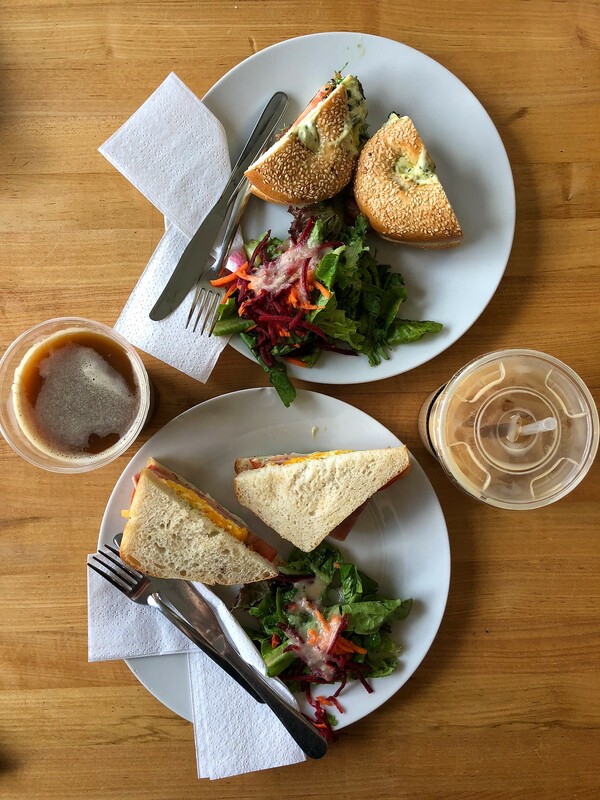 And it doesn’t hurt that it’s super Instagrammable too! Shop earrings, hat & similar floral two piece set! 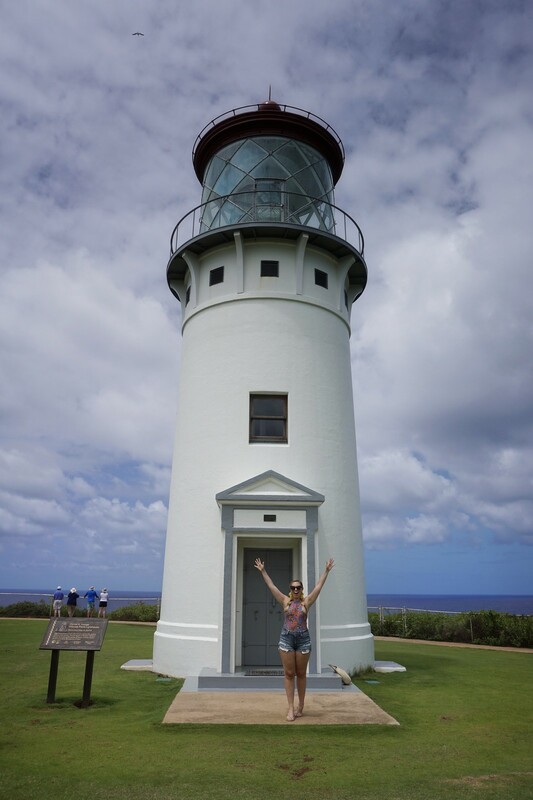 The Kilauea Lighthouse is located at the Kilauea Point National Wildlife Rescue. 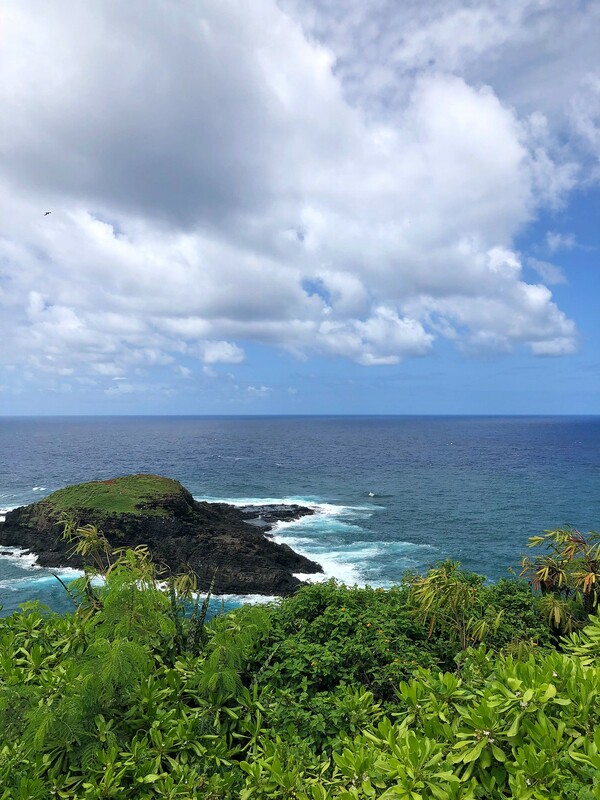 The admission is $10, but it 100% worth it to explore the point and see the wildlife. 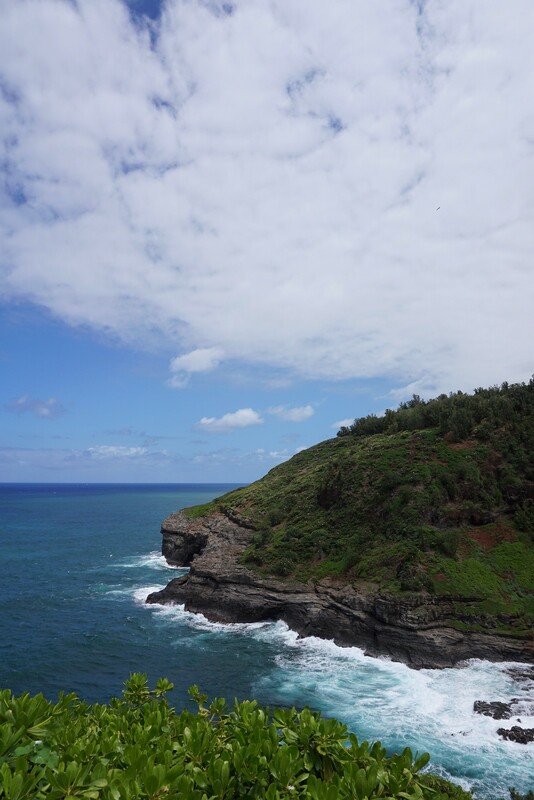 It’s the northern most point of the Hawaiian Islands, so that’s a fun piece of trivia you can tell your friends. 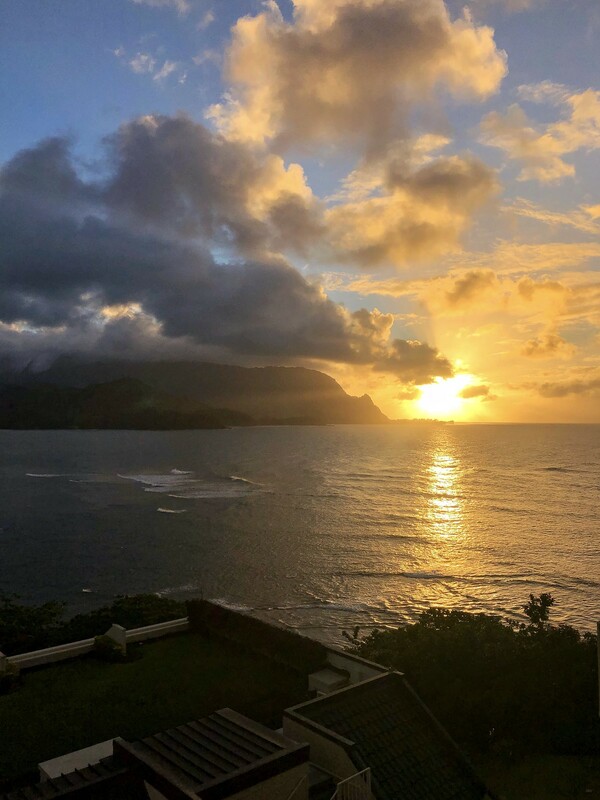 While we couldn’t afford to stay at the St. Regis Princeville (now known as the Princeville Resort Kauai), you don’t need to to enjoy the beautiful view from their lobby bar. 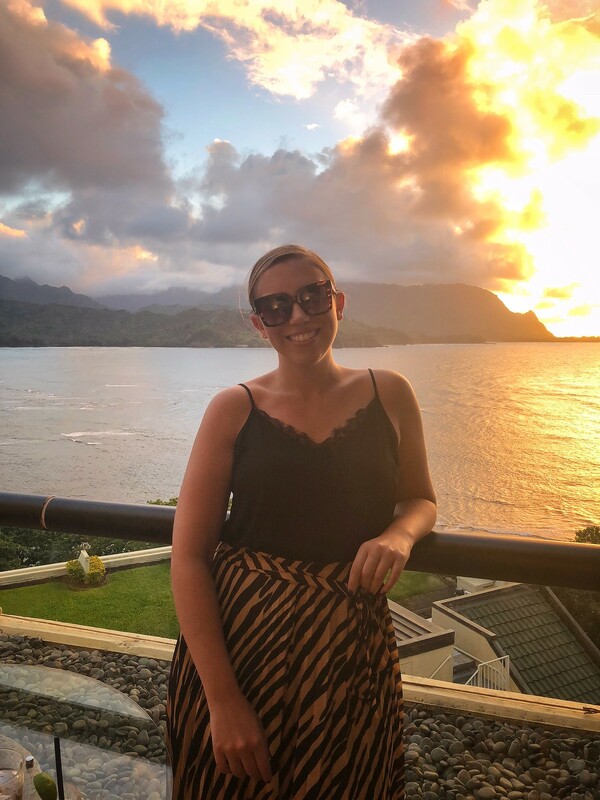 We, by complete accident, grabbed a table at the outdoor Princeville Bar just before sunset and were treated to the most beautiful sunset I’ve ever seen over the Hanalei Bay. 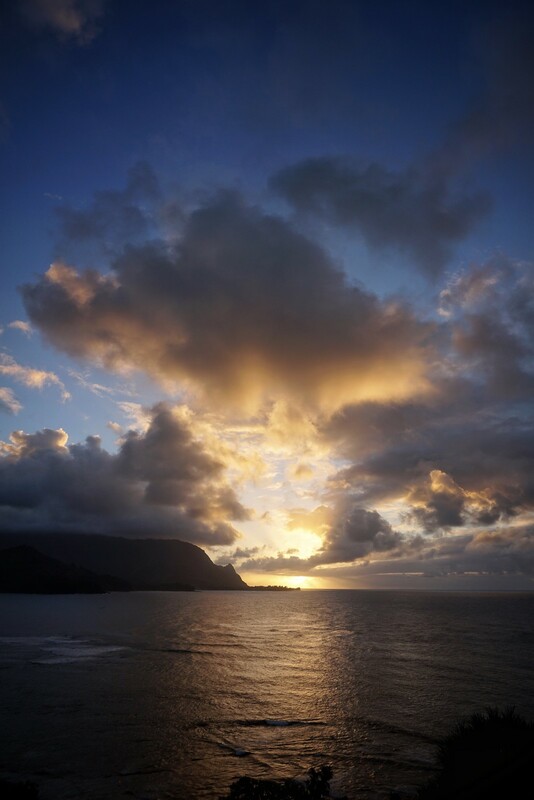 It is definitely THE place to see the sunset in Kauai since you can’t access most of the west side of the island! 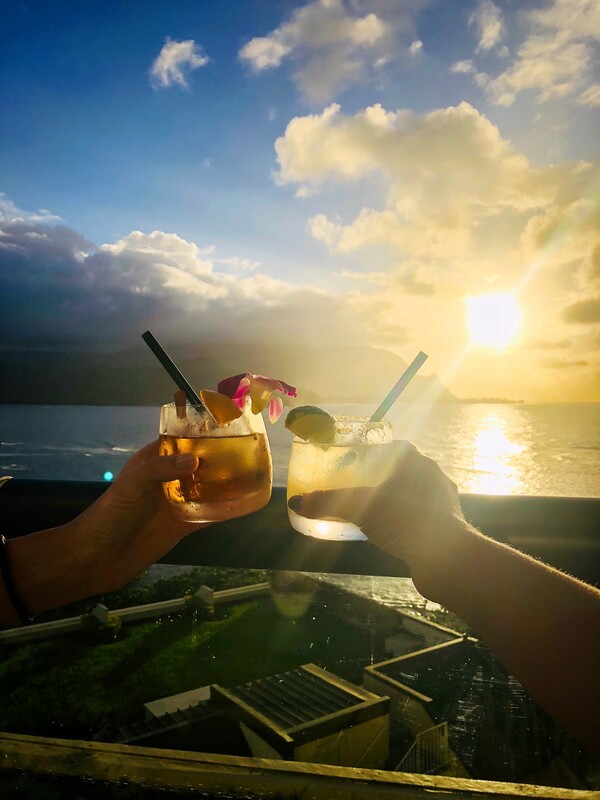 And the drinks actually weren’t that expensive which made it even more worth it and a definitely must do if you’re in Kauai. 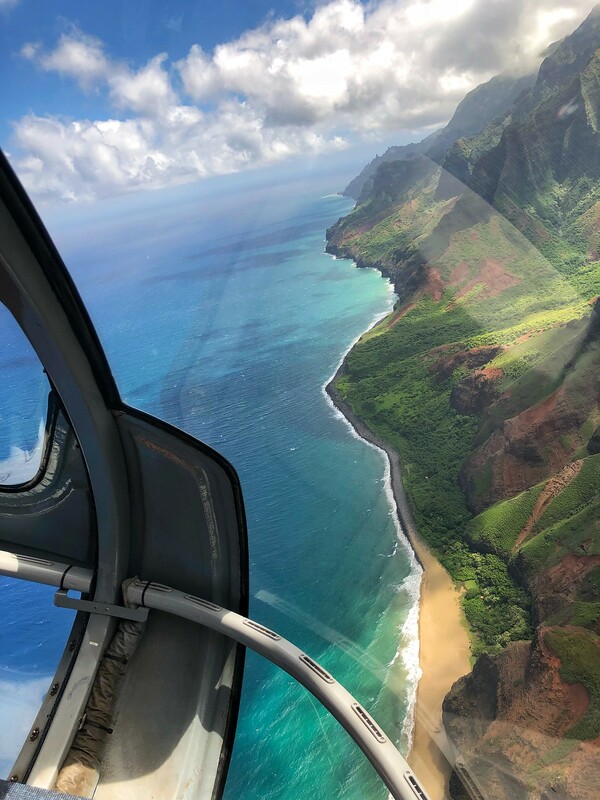 Did you know that 70% of Kauai is inaccessible by land? 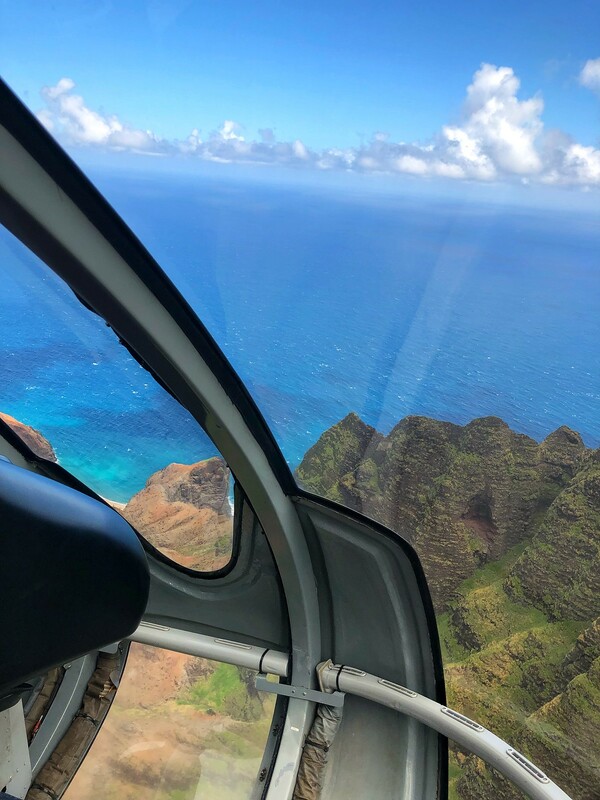 It’s truly best seen by the air so we booked a helicopter tour with Blue Hawaiian to see the entire island. 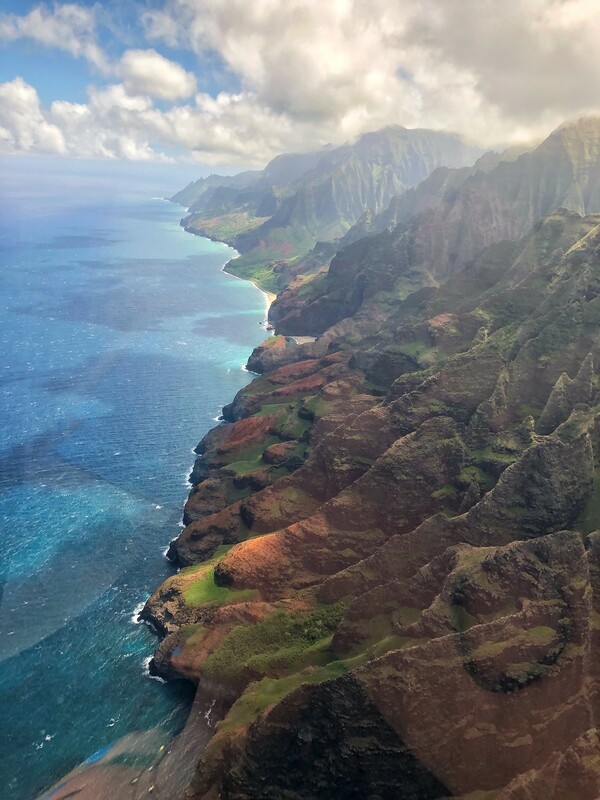 In particular the Napali Coast and the Waimea Canyon (the Grand Canyon of the Pacific) and also got to see the waterfall made famous by Jurassic Park and the most amazing blue water. 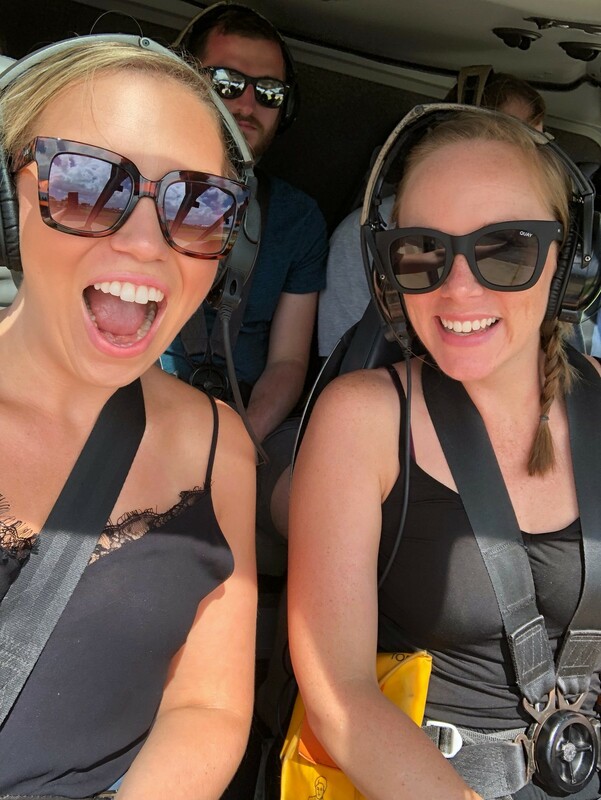 We were lucky enough to go on a day with perfect weather and barely any clouds and were able to see everything and were able to safely fly into Mt Wai’ale’ale, a dormant shield volcano with over 450 inches of rainfall each year, making it the second wettest places on earth. 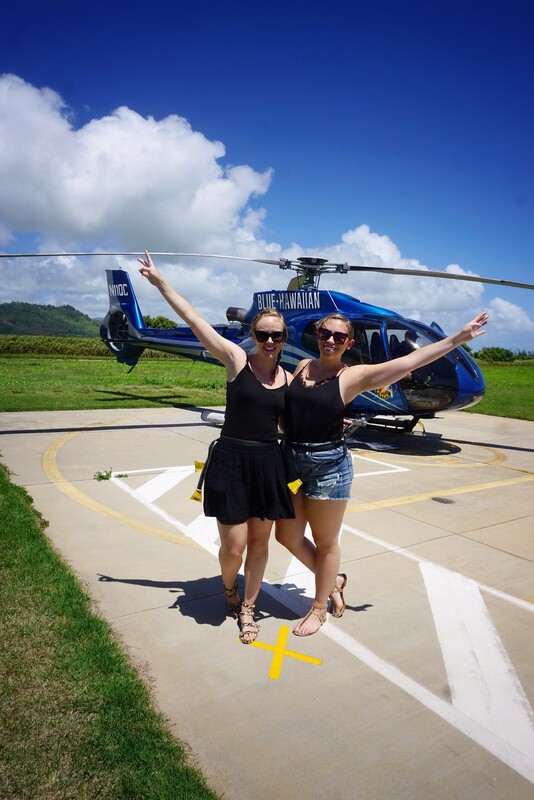 I’m not going to lie I was pretty terrified before we got on the helicopter, but I’m SO glad we did it. It was hands down one of the most memorable experiences of my life. 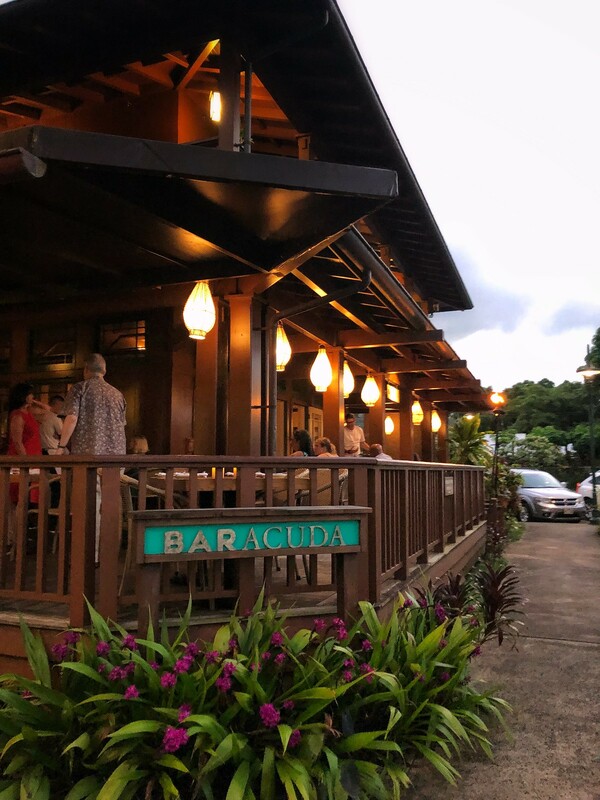 Dubbed as the Foodiest destination on the island, we knew we HAD to eat at Bar Acuda. 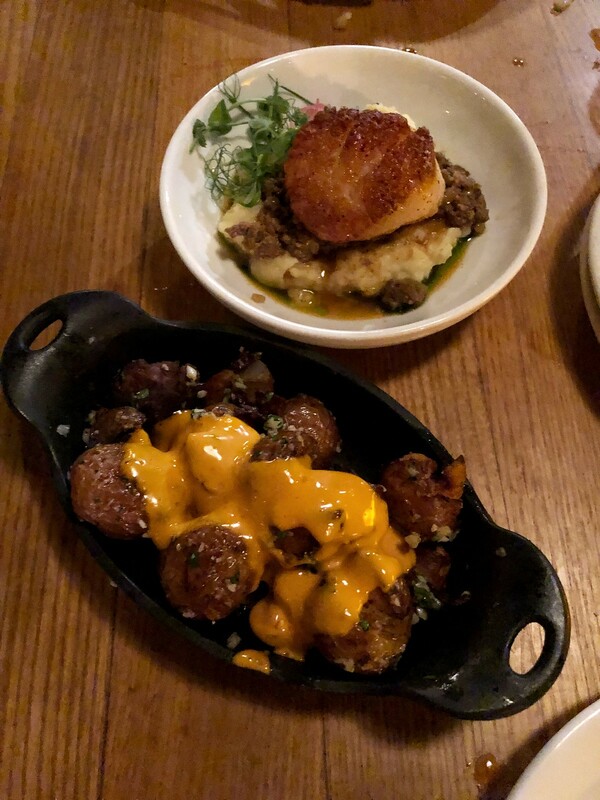 It’s a tapas restaurant in Hanalei and you’ll be tempted to order one of everything on the menu. 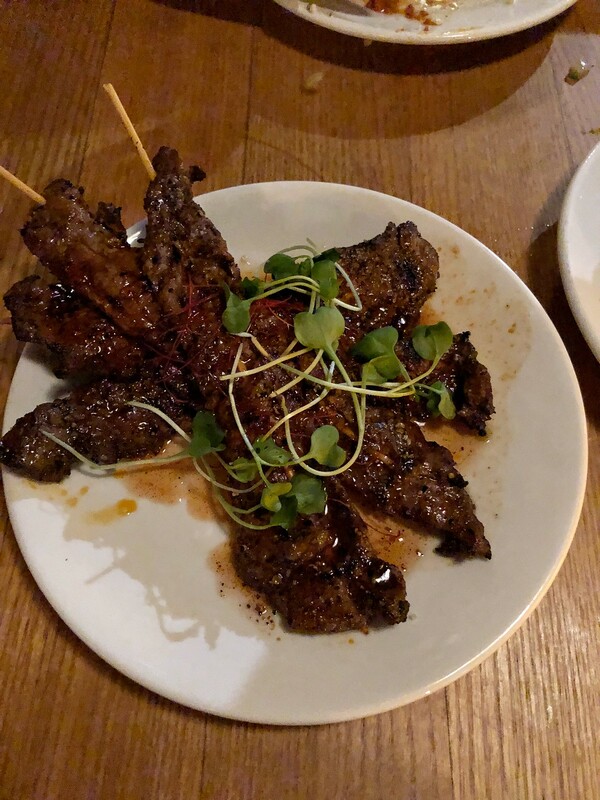 We asked our waiter for recommendations and loved everything! Make a reservation well in advance! But bring your bug spray, I literally had to go back to the car mid dinner to reapply it. 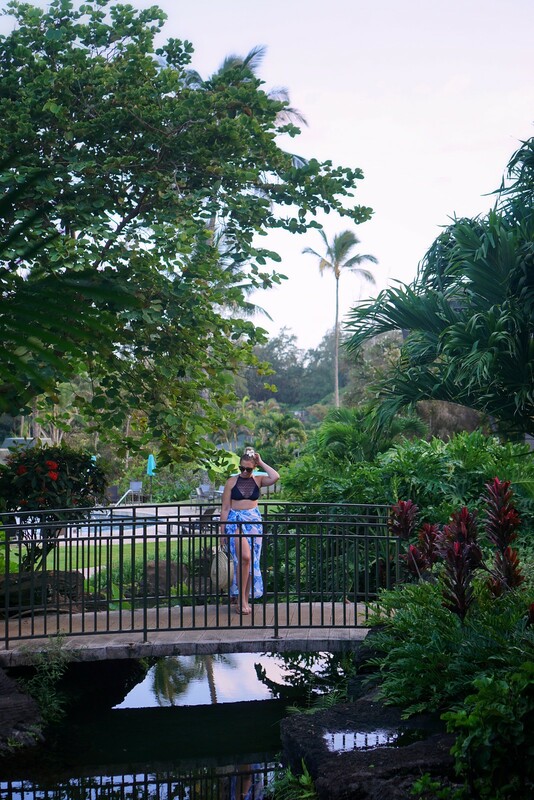 Kapaa was definitely my favorite town in Kauai and lucky for us it was right near where we stayed at the Hilton Garden Inn. 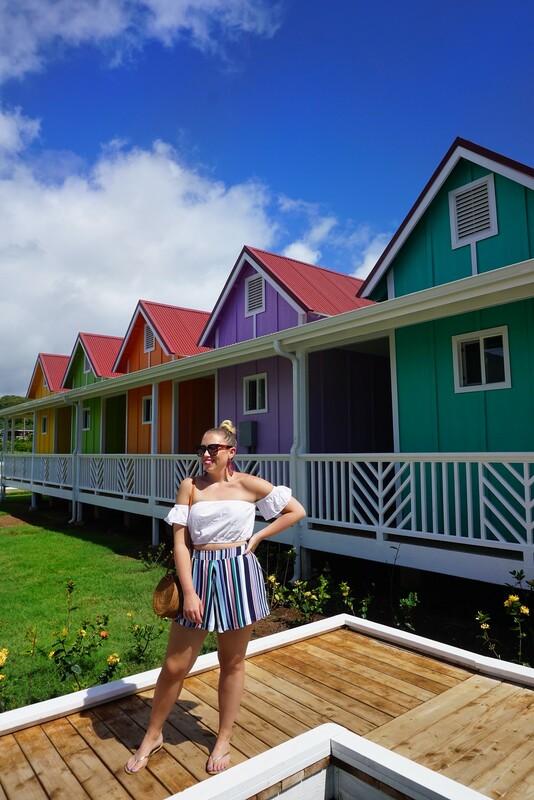 Let’s just say it was very on brand for me, lots of colorful stores and restaurants, and just the cutest town ever. 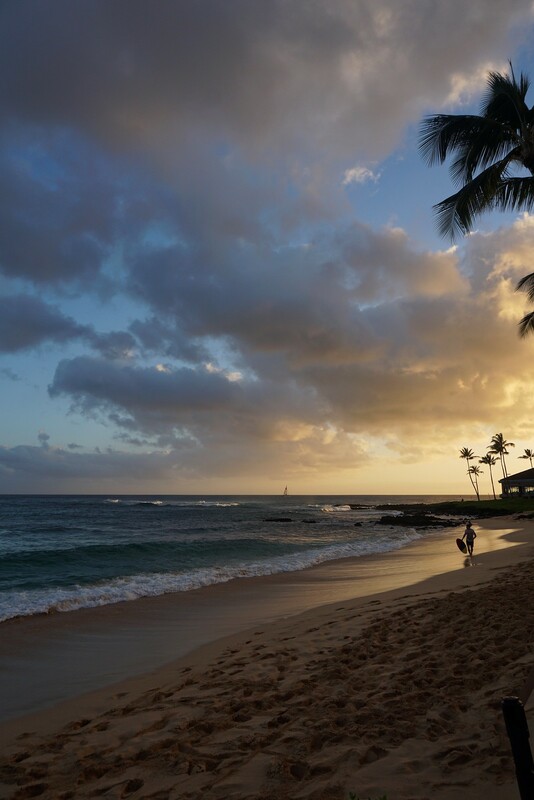 It’s the perfect place to shop for gifts and a little something for yourself. 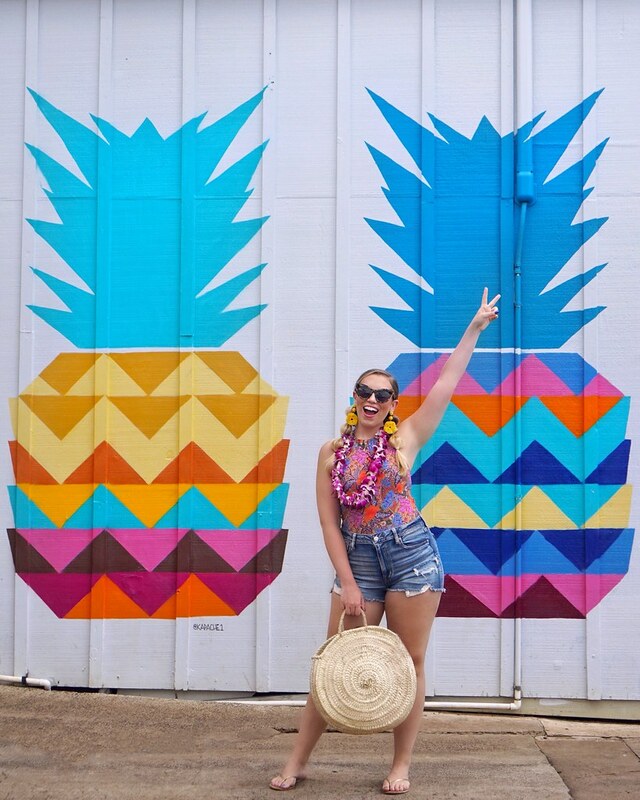 And definitely eat at Java Kai (and snap a photo in front of their pineapple mural). 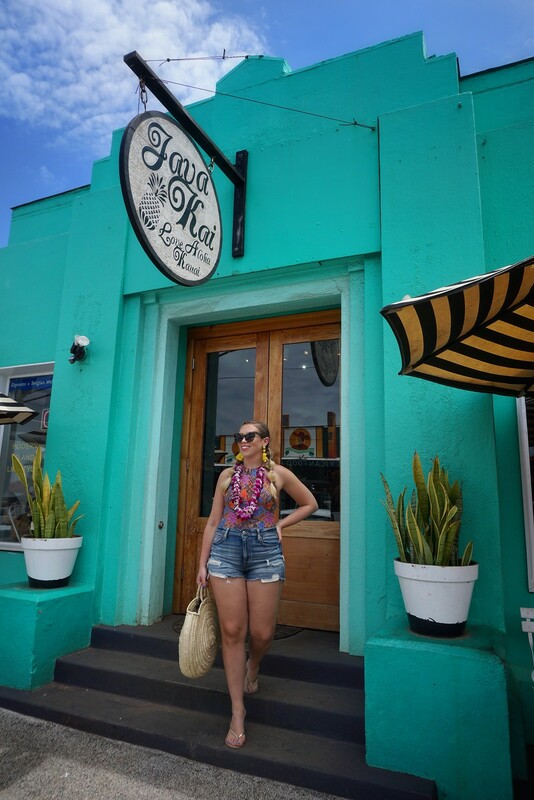 NoKa Fair is a sustainable and affordable shopping destination for local vendors. 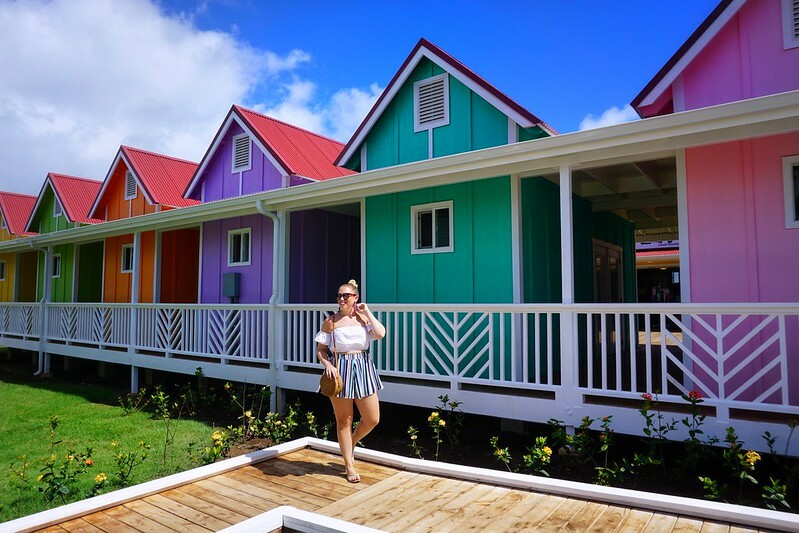 They’ve repurposed and recycled shipping containers to create colorful shops on a boardwalk setting! 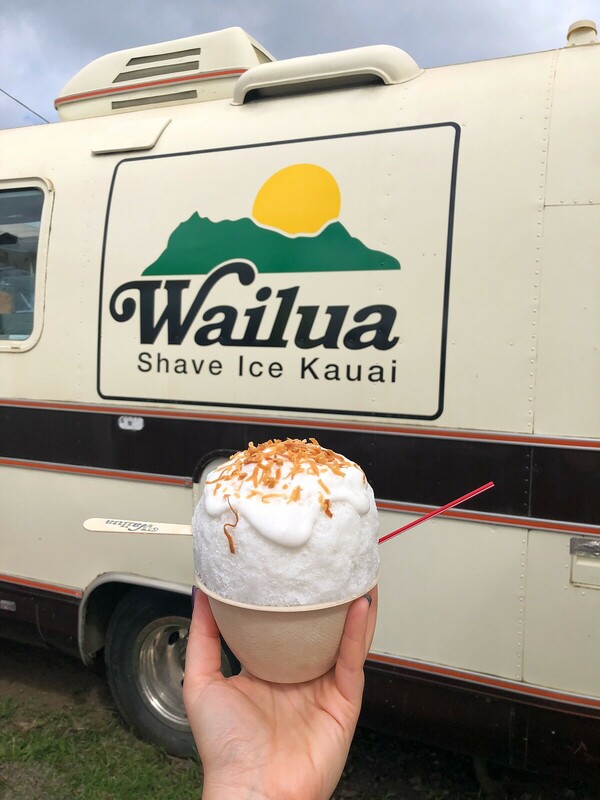 I know I already included a visit to Kapaa on my list, but the NoKa Fair deserved it’s own number. 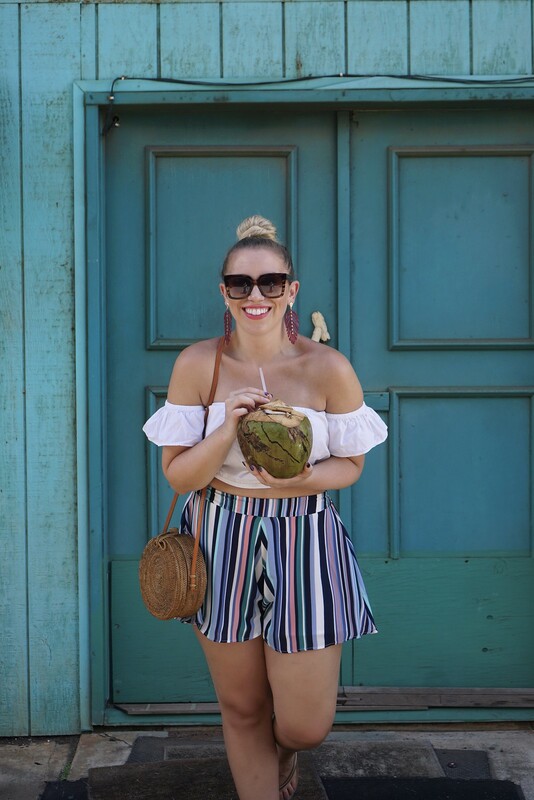 Shop rattan bag & similar shorts! 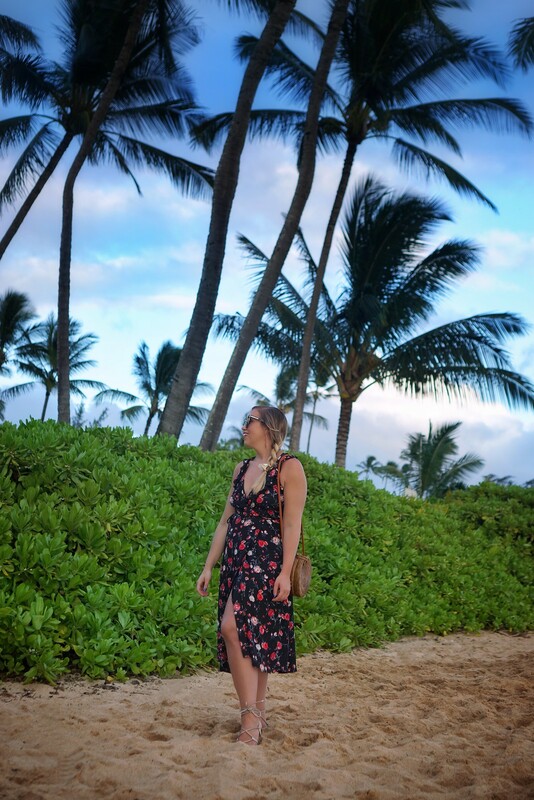 When deciding on a hotel in Kauai we knew we wanted to stay somewhere in the middle of the island and booked at the Hilton Garden Inn in Wailua Bay! 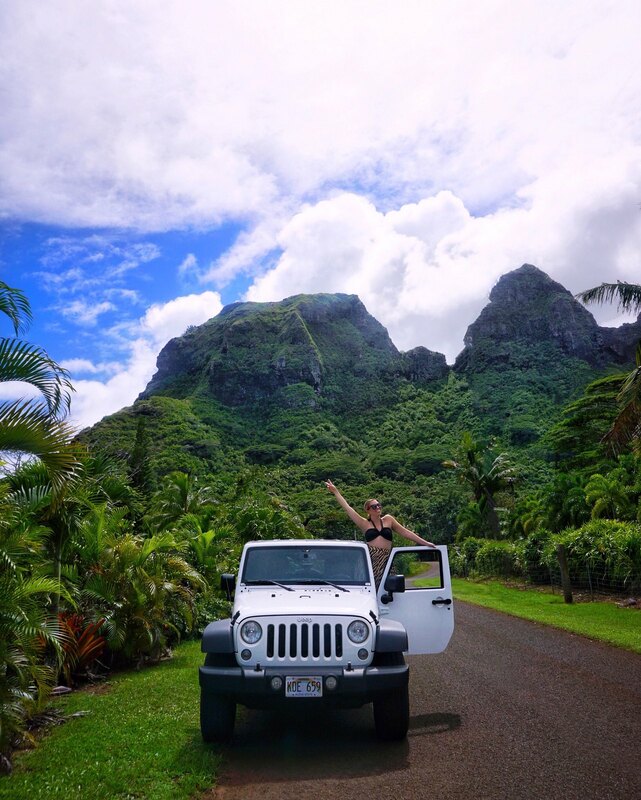 It was SUCH a good idea because no matter where we explored we didn’t have to drive too far. There is only one road that goes from the north to the south and staying on that road was essential for exploring everything! 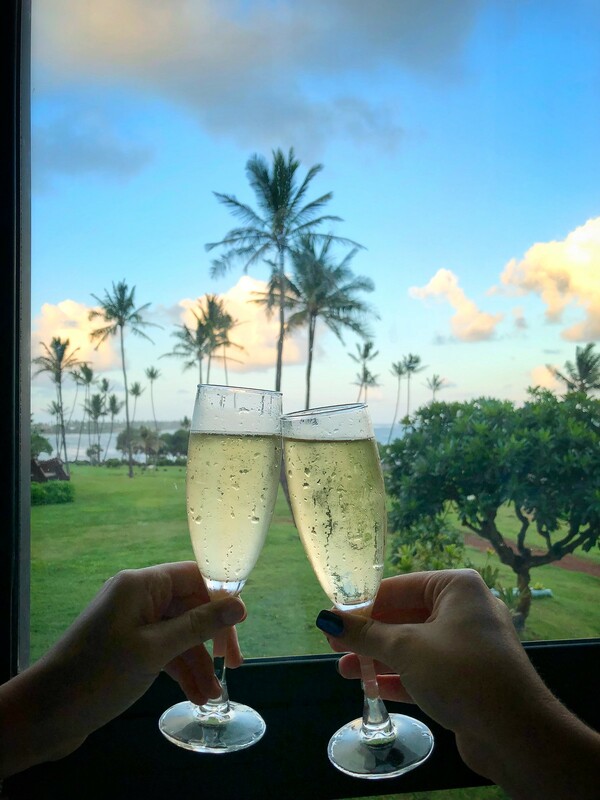 The hotel was so clean and new and had such beautiful views! 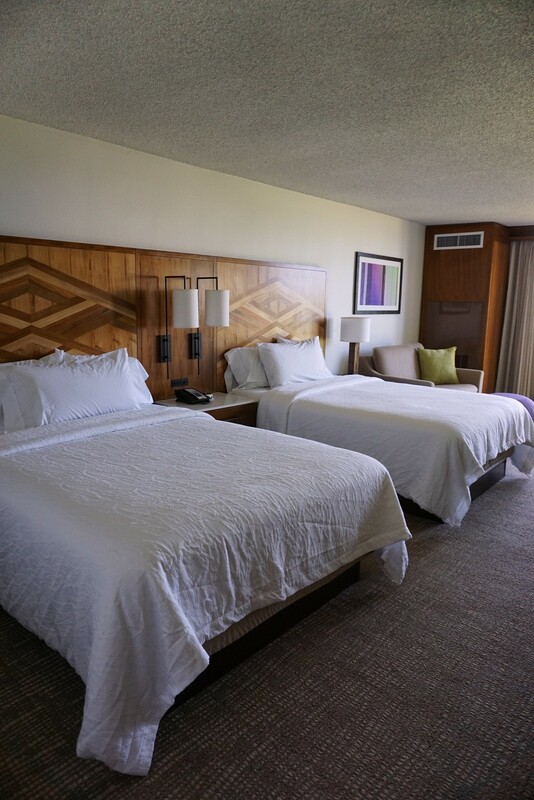 I highly recommend it if you don’t know where to stay! 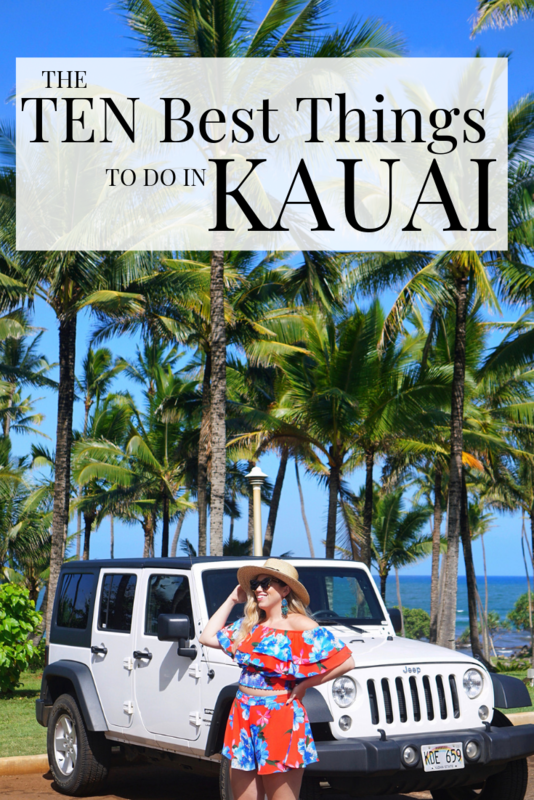 I know I said this was going to be a list of things that you might not heard to yet, but I just couldn’t leave going to a luau off of my best things to do in Kauai post! 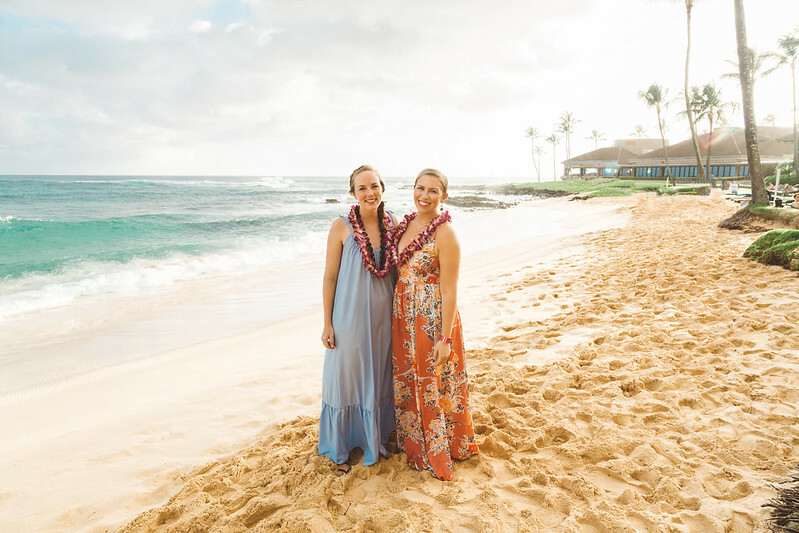 We had the best time and you can’t leave Hawaii without going to one. 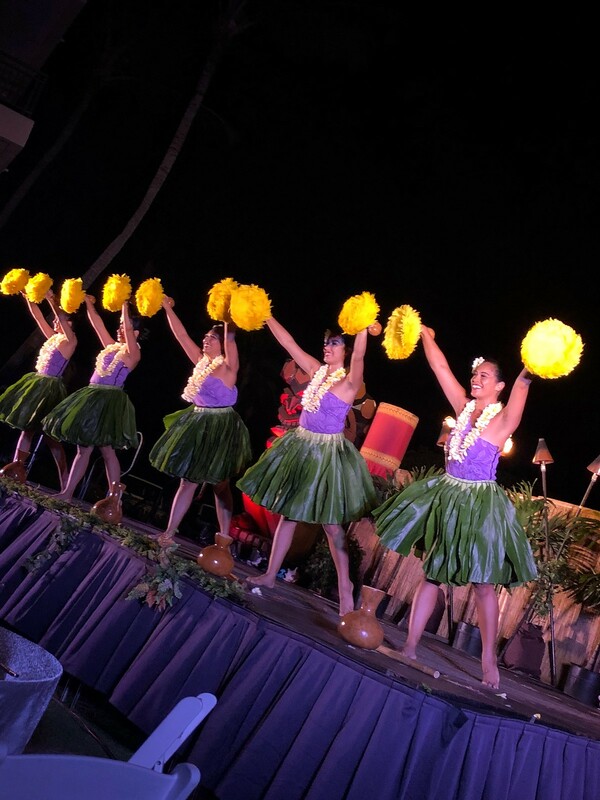 We went to the Aulii Luau at the Sheraton Kauai Resort because it was the only oceanfront luau on Kauai and it didn’t disappoint. I also suggest purchasing premier seating tickets which allowed us not to have to wait online to get in and have premium seats near the stage for the show!